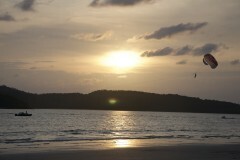 Most visitors and travellers to Langkawi spend the majority of their time near one of the coastal areas or beaches, say Pantai Cenang or Pantai Tengah. 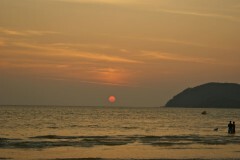 For a different island experience, however, the interior of Langkawi is as active an encounter as the rest of Langkawi. The leisurely pace of the area’s back roads and villages has kept traditional lifestyles more intact and it’s well worth being included in your itinerary. Can’t get much greener than this. You can define these areas outside of Kuah Town as Kampung Kedawang, Padang Mat Sirat and Pandang Lalang to the north. 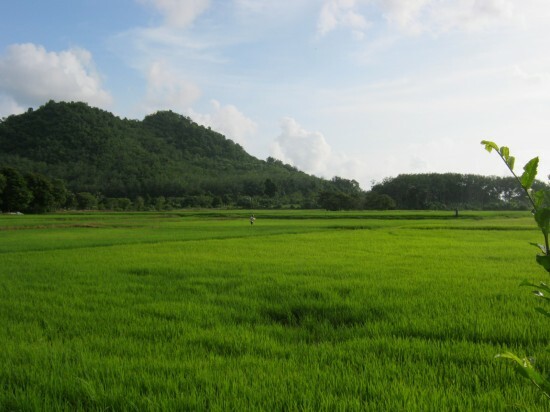 The area is a mixture of paddy and fruit and rubber plantations bordered by rainforest — so in other words, lots of nature. 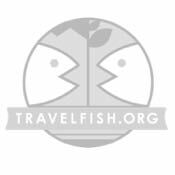 Quite a few inexpensive hotels and guesthouses are to be found in these areas, as well as homestays, some better than others. With many of these places you’ll get the cultural experience of living side-by-side locals. And with that experience comes a few guidelines. Not to hamper your sense of adventure, but please do remember that modest dress and behaviour win bonus points, especially in smaller villages. You’ll be getting attention as it is — you just don’t want the wrong kind of attention. In Kedawang, there’s The Great Peak Inn starting at 40 ringgit for a small room through to 120 ringgit for a large family room. It’s a bit plain but that’s reflected in the price. There’s also Anz Langkawi Inn with standard rooms for 80 ringgit. This hotel offers WiFi, hot showers, TV and air-con with great views and you can’t help but warm to Azif, the proud owner/operator. The well-landscaped restaurant next door, Pak Syed’s Corner, has a comfortable garden atmosphere and offers Western, Chinese and Malay food at reasonable prices. Pak Syad Corner for your dining pleasure. 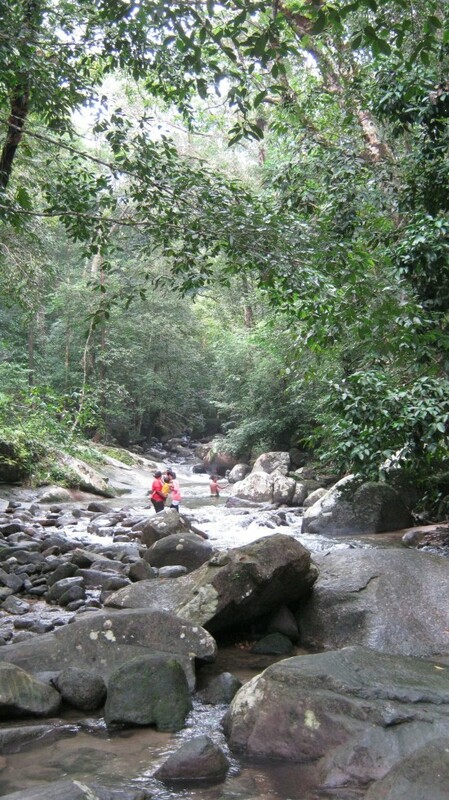 Heading into the interior on the old marble road you’ll find the Kampung Tok Senik Resort. This resort spreads out over the hillside and is nestled in the thick jungle surrounding it. 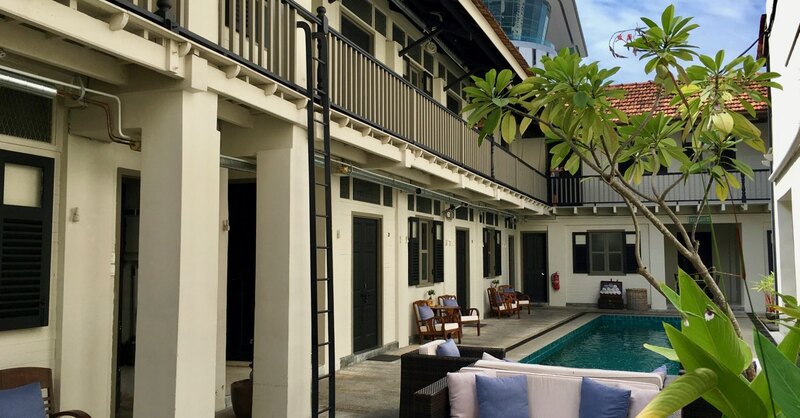 With a beautiful pool and two restaurants it’s good value, with rooms starting at 95 ringgit and going up to 240 ringgit. 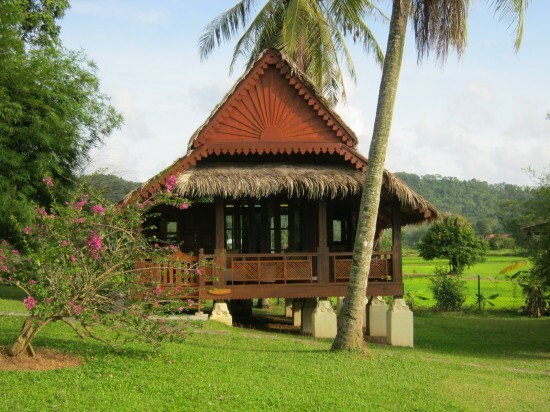 Further into the mid-valley you’ll find the Fox Hill Resort with three traditional Malay houses, the main house having been used as a reception hall for an island chieftain over 100 years ago. Prices start at 150 ringgit for a single person and go up to 370 ringgit for four in a single house, including breakfast. Just across the road from Fox Hill is Sunset Valley. 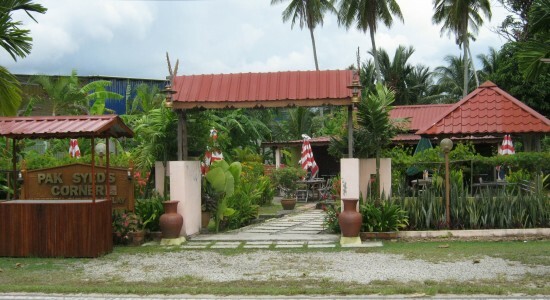 Sunset Valley has rebuilt traditional Malay homes from various regions in a park-like setting sloping down to paddy. All of these buildings have been extensively restored and one is more than 120 years old. All the houses are equipped with kitchens and air-con. Prices are 240-375 ringgit with a three-day minimum stay. Long-term stays of a week or month or more are available at a good discount. Sunset Valley is picture perfect, no? There are plenty of sites to explore in the interior. Buku Kampung or Book Village is a small park at the base of Gunung Raya off Jalan Padang Gaong. The river cascades down the mountain and through a series of pools that are surrounded by the park-like setting of the now-defunct Book Village buildings. There are toilet facilities, barbecues, benches and picnic tables available. It’s busy on the weekends but during the week you’ll have it mostly to yourself. Next to the Book Village is the Langkawi Agro Technology Park. This large complex offers the visitor a chance to learn about the local fruits and vegetables as well as eco-technologies to improve yields. Entry fee is only 20 ringgit for adults and 10 ringgit for children. You don’t have to be an “agro-tourist” to appreciate the beautifully maintained grounds or sample the you-pick-em fresh from the tree produce. From Book Village you can also take the trek up the 4,287 steps to the top of Gunung Raya, the tallest mountain on the island. The steps can be blocked in places at times by overgrowth and fallen trees and the climb isn’t for the faint of heart, but the view, 881 metres high, is tremendous. This is also the step off place for a trek into the jungle to zip-line Tarzan-style through the million-year-old rainforest. 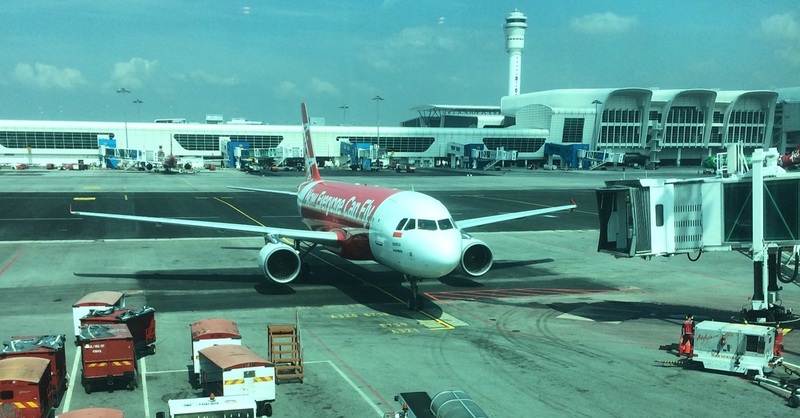 This non-budget adventure can be arranged with Langkawi Canopy Adventures or WHOA! Adventures of Langkawi by appointment only. Gunung Raya can also be accessed by road off Jalan Ulu Melaka. One of the main bird-watching hot spots, you’ll most likely have more than a few slam-on-your-brakes moments on the way to the top. Bird’s eye view of Langkawi — and great cell phone connection! 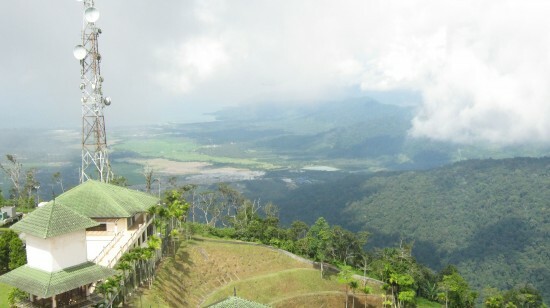 At the top of Gunung Raya is The Peak Hotel and Spa. It features absolutely incredible views from the rooms and even has an observation tower in addition to Langkawi’s only Vietnamese restaurant. With a 360-degree view of the entire island archipelago, it’s simply breathtaking — really. But if you have a problem with vertigo, do stay away from the railing! In addition to the small local roads and the surrounding areas, there are a few official sightseeing venues. For history and cultural buffs, the Ancient Tomb is free of charge and Kota Mahsuri, which honours the legendary Princess Mahsuri, is only 10 ringgit for adults. The Buffalo Park is an often over-looked sightseeing venture. This family-run operation lets you get up close and personal with murrah and swamp water buffalo as well as sample fresh buffalo milk, cheese, yoghurt and even ice cream — it’s all made on site. And if riding a water buffalo or even milking one happens to be on your bucket-list, this is the place to go. Serious bang-for-your-ringgit at the night markets. Dining in the villages in the interior is generally limited to the local restaurants that serve Malay and some Thai-influenced dishes. These small roadside restaurants are prolific and offer you a respite from your touring of the back roads. The night market food stalls in the area are a great bang-for-the-ringgit experience. Ulu Melaka on Mondays, Kedawang on Tuesdays, Bohor Tempoyak on Fridays and Mat Sirat on Sundays are a great way to experience local delicacies offering a wide variety of foods at budget prices. 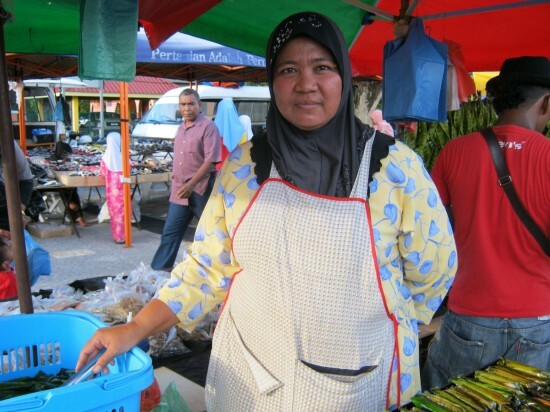 They’re extremely popular with the local islanders and give you an introduction into local cuisine and market goods. Taxis in these areas may be difficult to source at times, so you’re better off renting a scooter or car. If its rainy season you may find travel more comfortable with the latter, or you can do what the locals do and pull off the road and wait-out passing showers.